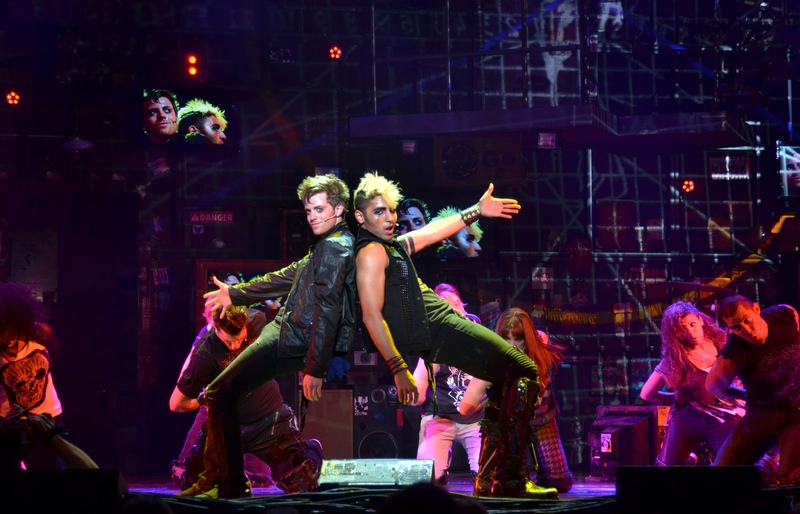 If you saw American Idiot during the touring show’s recent Columbus stop, Passing Strange may give you a feeling of déjà vu. But it won’t last. Though both musicals are about youthful angst and wanderlust, Passing Strange is infinitely more personal and personable. The black teen at its center may be known simply as the Youth, but his globe-trotting adventures are far from generic. With book and lyrics by Stew, who co-wrote the music with Heidi Rodewald, the tale is also filled with heart and satirical humor. That distinguishes it from American Idiot and its angry punk-rock rants. In short, the average (read: non-Green Day-worshipping) theatergoer is more likely to enjoy Passing Strange, especially given the wonderful production that Short North Stage and director Mark Clayton Southers have put together. It’s hard to imagine a more perfect cast. Taylor Moss is graceful, impressionable and self-centered as the Youth, who believes he’ll never come into his own as a musician until he escapes his South Central L.A. home. Michelle Golden is devoted, possessive and pitiable as the Mother, who wants her son to be happy but can’t understand why he has to leave home to do it. Each member of the supporting cast plays multiple roles and has one or two chances to really stand out. For example, Rico Romalus Parker raises spirits as the sermonizing Rev. Jones, while David Glover is delightfully mischievous as his pot-smoking son. Mia Angelique Fowler and Zoe Lathan leave indelible impressions as various girls and women who pull the Youth into their spheres of influence. All display fine voices, but the mightiest pipes properly belong to Ron Jenkins, who pushes the tale along as the all-seeing Narrator. Though Passing Strange’s 2008 Broadway production won a Tony only for its book, the songs throb with wit, spirit and warmth. A charismatic band supplies both instrumental and vocal support under the direction of P. Tim Valentine, while gyrating cast members often carry the infectious beats into the aisles. Back on the somewhat echo-y stage, Robert Kuhn’s two-story set is marked by a series of doors that symbolize the Youth’s quest for relevance and fulfillment. Speaking of that quest, the musical makes it clear that all choices come with a price. The finale is tinged with regret as it questions the value of art. In creating fiction, the rueful Narrator asks, are artists merely attempting to make up for their real-life shortcomings? Humorous and uplifting, thoughtful and heartbreaking, Passing Strange is the kind of transcendent musical experience that comes along all too rarely in Columbus. If you miss it, you’ll regret it. Short North Stage will present Passing Strange through May 5 at the Garden Theater, 1187 N. High St. Show times are 8 p.m. Friday and Saturday and 3 p.m. Sunday. Running time: 2 hours, 45 minutes (including intermission). Tickets are $30. 614-725-4042 or shortnorthstage.org.